For laboratories needing a high-performance atomic absorption (AA) spectrometer, the PinAAcle™ 900H is a combined flame/deuterium furnace system with continuum source background correction. Through its ability to switch between flame and furnace in seconds, cutting-edge fiber optics to maximize light throughput for improved detection limits, high-speed automatic wavelength drive, automatic lamp selection and stored analytical methods, the PinAAcle 900H can determine up to 20 elements in one completely automated run, maximizing your productivity. 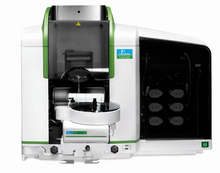 Plus, it features TubeView™ color furnace camera for easier autosampler tip alignment and sample dispensing, as well as to monitor drying and pyrolysis during analysis for simpler method development. All of this in the smallest flame/furnace AA footprint, saving valuable bench space. The PinAAcle 900H is controlled by the proven WinLab32™ for AA software – whoever the user and whatever the application, WinLab32 software makes it fast and easy to get from sample to results. By reducing the time required for method development, sample analysis and report generation, WinLab32 streamlines every step of your workflow for enhanced laboratory productivity.